Sometimes, you just gotta get away. Away from the crush of humanity, the hurried lifestyle, the press of responsibilities. What better way to do that than with a nice, relaxing cruise? Thanks to WMPH Vacations, now you can plan one with Cruise Finder, their little travel app. This baby allows you to peruse through 25 destinations, over 12,000 itineraries, and more than 220 cruise ships hailing from 20 different cruise lines. That’s a lotta vacation time. All this information can be found on the Home tab. The first set of links allows you to Quick Search cruise lines and ships, even deck plans (so you know what you’re getting onto)! The one you’ll be using most often, though, is the first one: Cruise Finder. Tapping on it will take you to the Search tab, as well as bring you to a subset of options that you can search by: Destination, Sailing Date, Number of Nights, Cruise Line (which inexplicably shows up twice), etc. You can actually use more than one filter (usually) while searching: just tap on the one that’s most important to you, then filter out from there. The search results can be sorted by date, price, or cruise lines. Once you find a cruise that suits you, you’ll be taken to the itinerary. Prices for rooms (Inside, Outside, Balcony, Suite) will show up beneath the words; for a look inside the rooms, just tap the price or the empty box below the words. From there, you can also read descriptions of the rooms. If you’re trying to figure out just which cruise to take, tap the star on the top right to add the cruise to your Favorites list, so you can refer back to it. For all the cruises, you can request a quote by filling out a form. Another set of links that should be of interest is under Cruise Information (still on the Home screen). Once there, you can read up on extensive passport requirements, find out how to get to a port, and get a preview of what the weather conditions at a certain port is going to be like. If you’re feeling a little thrifty, the third tab, Hot Deals, is for you. Look for last minute or holiday specials to take advantage of! Cruise Finder is chock full of lovely information; so much, it’s a bit overwhelming, if comforting–you won’t feel like you’re missing out on anything. The app could use with a bit of cleaning up (there are a few links that show up in more than one place, which is redundant), but it’s beautifully designed and very user-friendly. If you want to book a cruise but don’t know where to start, definitely give Cruise Finder a try. Not only does it make the search smooth and painless, it’s free (c’mon, it’s a cruise, you’re already paying enough). AppSafari review of Cruise Finder was written by Julie Guan on September 2nd, 2010 and categorized under App Store, Free, Travel. Page viewed 5837 times, 1 so far today. Need help on using these apps? Please read the Help Page. This is a great app for making cruise line decisions. The fact it gives you everything about the cruise line and even the ship you are interested in is amazing! I would definitely recommend to my friends. Love it!!! 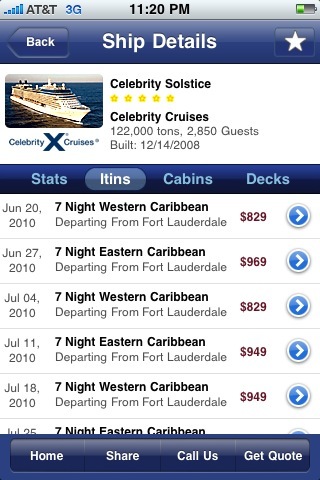 amazing technology- able to book cruises on my i-phone! I booked an 11 night, thanks iCruise! Awesome app love it easy to use…. 🙂 looking forward to booking a cruise. 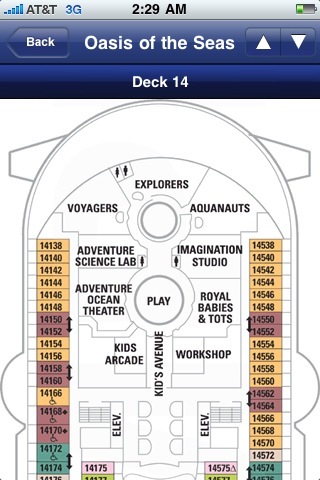 These deck plans are too cool, I never thought you could fit Oasis of the Seas on the iPhone… but they did it 🙂 They’ve even got deck plans of ships that aren’t out yet, very cool planning tool. Wow, I loved the iCruise app… I gave it 5 stars. Quick and Easy. Just like it should be.